The Trinity Alps from our sunset vista. In my last post, I included a few images that captured the view of the Trinity Alps from our vantage point above the Pacific Crest Trail. The vast mountain range lies just west of the Trinity Divide and, in many ways, forms the great wilderness backyard for the Mount Shasta area. Knowing that this vast alpine paradise lies so close is a comforting thought when even the mountains around Mount Shasta seem insufficient to escape into. Their presence also enhances the local hikes. The horizon for many trails on Mount Shasta and along the crest of the Trinity Divide feature fantastic vistas of the dragontooth-like horizon formed by the many jagged spires and towers of the Trinity Alps. A great deal of area falls within this viewshed. The area marked “N” is the Bear Lake Basin (actually the basin containing Little Bear Lake, but it is a smaller part of the larger whole). It lies about 14 miles away from our sunset vista. In contrast, the peak marked “I” is Monument Peak, which is an impressive 42 miles to the south. The whole area in between is all part of the massive Trinity Alps Wilderness. 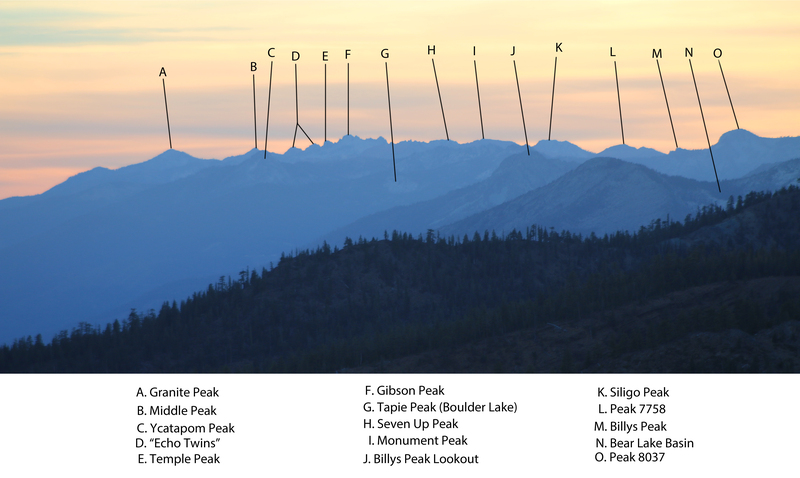 The 15 peaks (and 1 lake basin) identified here compose one of the more scenic portions of the Trinity Alps. Miles of trails course through this area and there are at least 14 lake basins visible here and a few dozen lakes contained therein. Some of these are among the most beautiful spots in all of Northern California. For those unfamiliar with this large mountain area, it may come as a surprise that this area is actually only the southeast corner of the Trinity Alps. There is far more wilderness in these mountains than is visible from this vantage point. The crest of the Scott Mountain, extending west from where we were hiking blocks out the majority of the range. To give some perspective, I made a locator that includes the same area, but from the perspective hikers enjoy from the top of Mount Eddy. 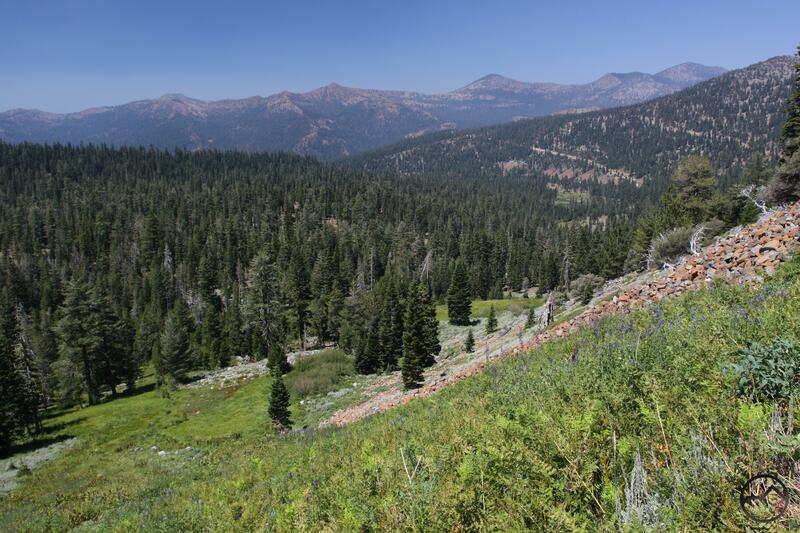 This view encompasses the entire eastern half of the Trinity Alps and includes the spectacular granite heart of the range as well as the western half of the Scott Mountains, which lies within the Trinity Alps Wilderness. That is a magnificent block of alpine wildlands. We are blessed to have such an incredible wilderness resource to enjoy so close to Mount Shasta. In the summer, when Parks Creek Road is open, the closest trailheads lie less than an hour drive away from town. Anyone who has been fortunate enough to explore these mountains know what a blessing they are. Of course, such an examination of the view to the south demands an analysis of the view north as well. From our vista above the PCT we could see numerous landmarks, most of which were in Oregon. The furthest away was Rustler Peak, which lay 88 miles away. Just south of that is the Fuji-like tower of Mount McLoughlin, the highest peak in Southern Oregon. 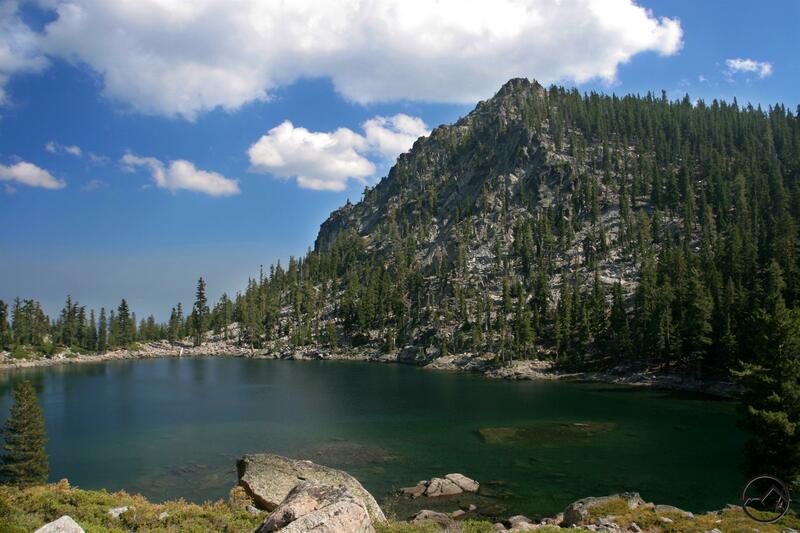 One particularly interesting feature was the highlands of the Mountain Lakes Wilderness. From our vantage it appeared a nondescript ridge but that area certainly offers more than you might guess when looking at it from the outside. 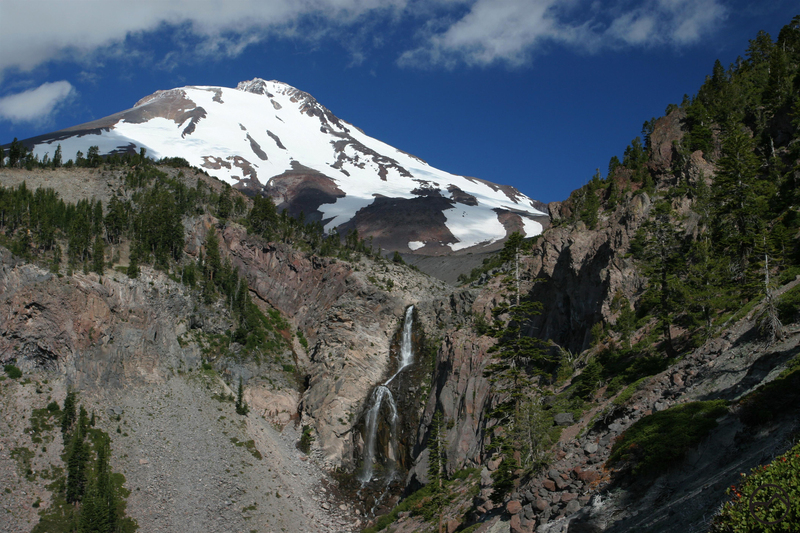 The interesting terrain is within a large caldera where rugged cliffs and numerous alpine lakes await hikers. All in all, that is quite a bit of terrain taken in from one vantage point. The viewshed extends 120 miles from north to south. That is not too bad for a very short, easy hike. The trail leads through beautiful terrain and is suitable for kids under 4 to hike! What is not to love about that?! Sunset view of Mount Shasta from the divide between the Trinity River and the Shasta River. Last night I took my family up onto the Pacific Crest Trail for one last hike in the high country before the snow comes. With rain (and high elevation snow) in the forecast one week from now, it seems unlikely I will get my whole family out on a hike in the mountains again. The shorter days meant that we had the opportunity to get out and up in the Trinity Divide for a reasonably timed sunset. We headed to the Parks Creek Trailhead and hit the trail in the midst of the low-angle afternoon sunlight. It was glorious. With gobs of rocks to climb and far-reaching views, it is a wonderful section of trail and one that is easy to do for families with younger children. You really can’t go wrong here. My family on the trail with the Trinity Alps in the distance. The sun was setting as we reached our destination, which was a low saddle just off the trail where fantastic vistas open up to the east, west and north. From here you can see much of the Trinity Alps, Mount Shasta, most of the Shasta Valley and deep into Oregon, crowned by the heights of Mount McLoughlin, southern Oregon’s highest peak. It is a fantastic vista and shockingly easy to get to. 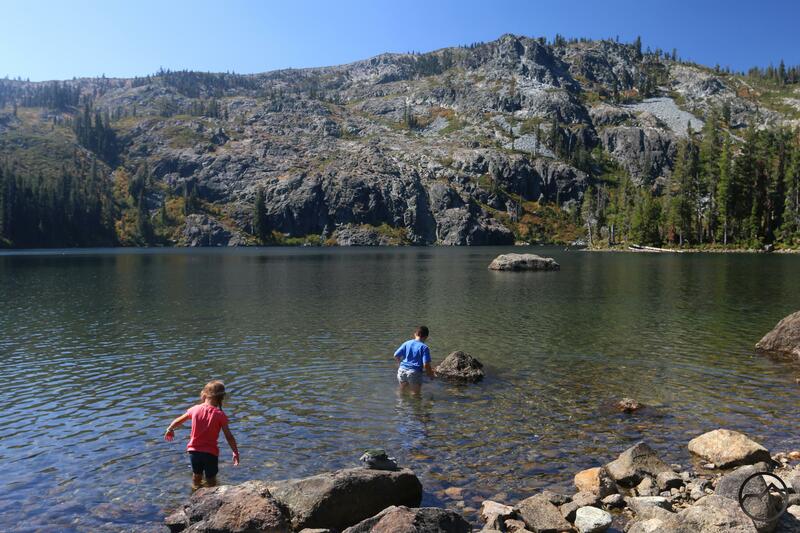 It really is one of the best kid-friendly hikes in the high country around Mount Shasta. Looking down on the hills of the Shasta Valley. Shadow moves across the town of Weed. The view north, across in the Shasta Valley and into Oregon, where the pyramid of Mt. McLoughlin dominates. Mount Shasta and rises beyond an unnamed peak. 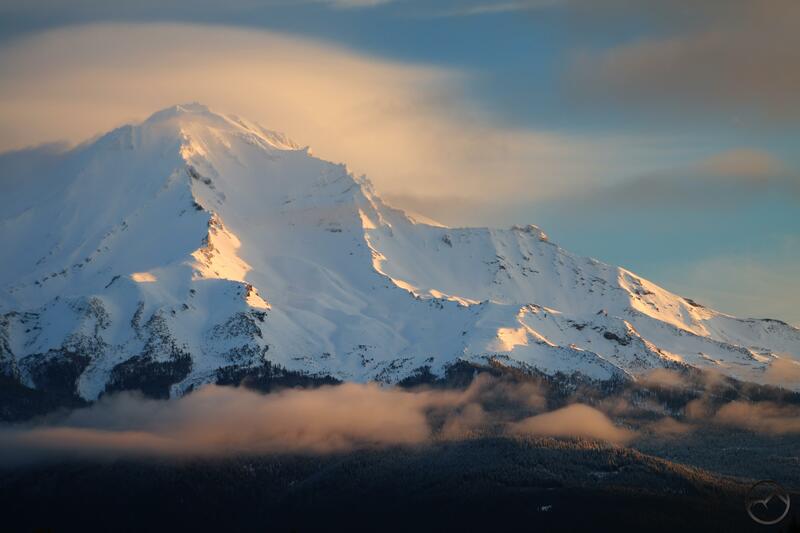 A closer view of Mount Shasta. Though the sun had set, we could see the Trinity Alps the whole way back. A closer view of the Trinities. We made it from our house to our vista point and back to our house in about 4 hours. This included a leisurely hiking pace and time to climb on rocks and watch the sunset. That kind of turn around time is one of the great things about the Mount Shasta area. Whether you live here or are just visiting, you can enjoy spectacular little outings with minimal time investment but offering the kind of scenery that makes lifelong memories. While not our last hike of the year, it is more than likely to be the last time my wife and I get all three of our kids on the trail higher up in the mountains. If this proves to be the case, it was a great way to finish the alpine hiking season. 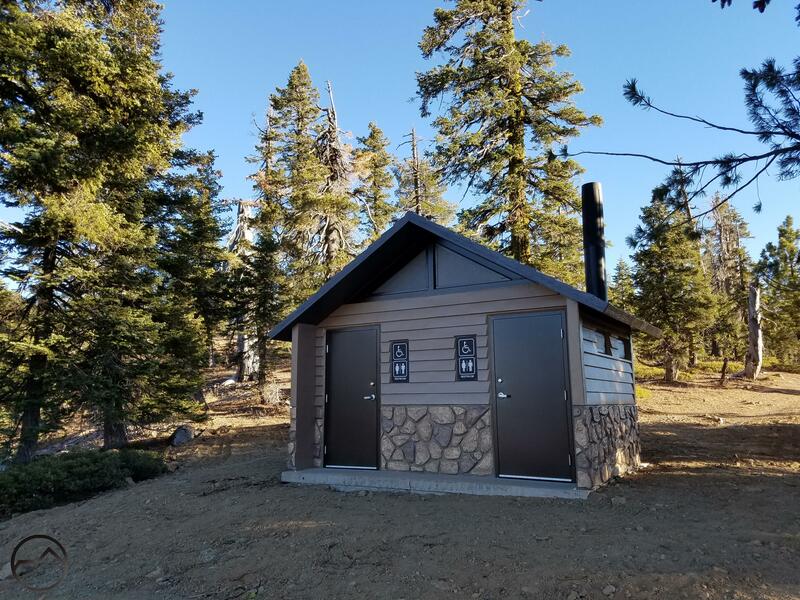 Also, I just want to commend all those involved in bringing about the installation of the new bathrooms at the Parks Creek Trailhead. The rock work is an especially nice touch. Much needed and well done! Blooming rabbitbrush is a colorful foreground to Mount Shasta and 3 of its massive glaciers. The Mount Shasta area is vast and varied. It is a delight to all those who love the natural world and yearn to enjoy it. 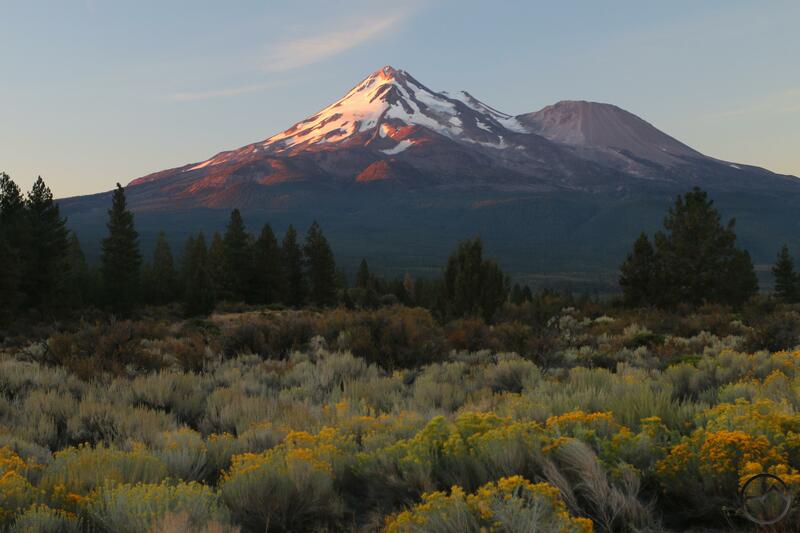 However, exploring Mount Shasta and its environs can be a daunting task, especially to admirers who have not spent much time in the area or have not had the opportunity to dive into the literature that records many of the areas blessings. 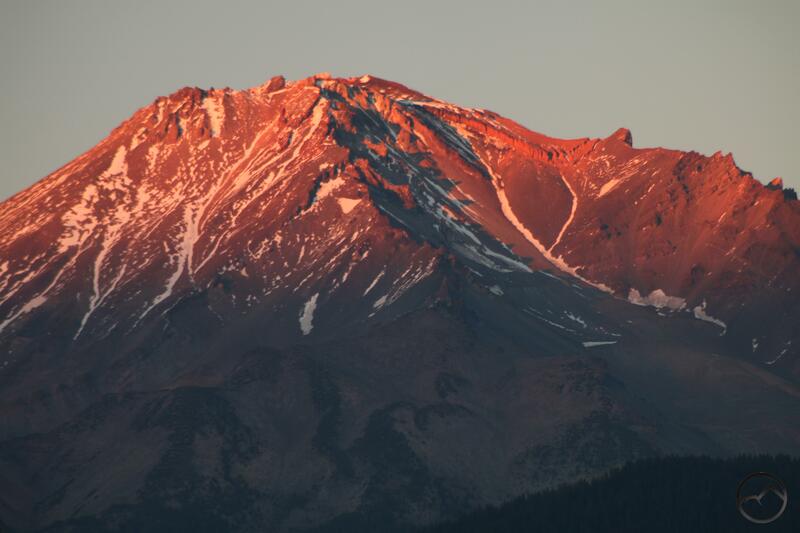 This reader is intended to pull together several articles and resources that have appeared on Hike Mt Shasta over the years and place them together in an easy-to-access setting. 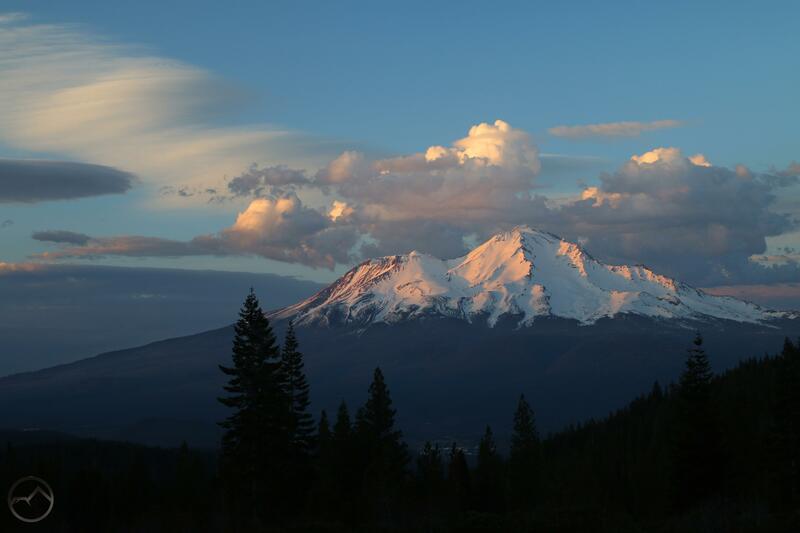 It is my hope that this will be a useful tool for deepening knowledge and appreciation of Mount Shasta, the surrounding mountains and all of Northern California! California is probably the most geologically diverse state in America. This in part naturally flows from it’s size but there is also an immense amount of diverse geology packed within its borders. The North State, which is the uppermost part of California, maintains this pattern and presents a confusing array of rock types, numerous mountain ranges and a wide variety of geologic forces at work. 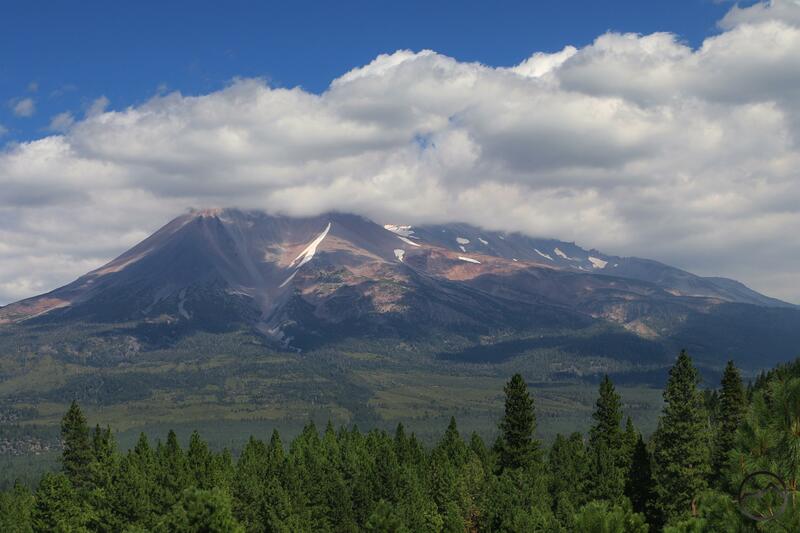 This series, “Breaking Down The North State”, offers a good introduction on the geography, geology, and various regions that surround Mount Shasta. Mount Shasta nearly a mountain range unto itself. There are dozens of landmarks and features waiting to be identified, though there are few easy to use resources to help. 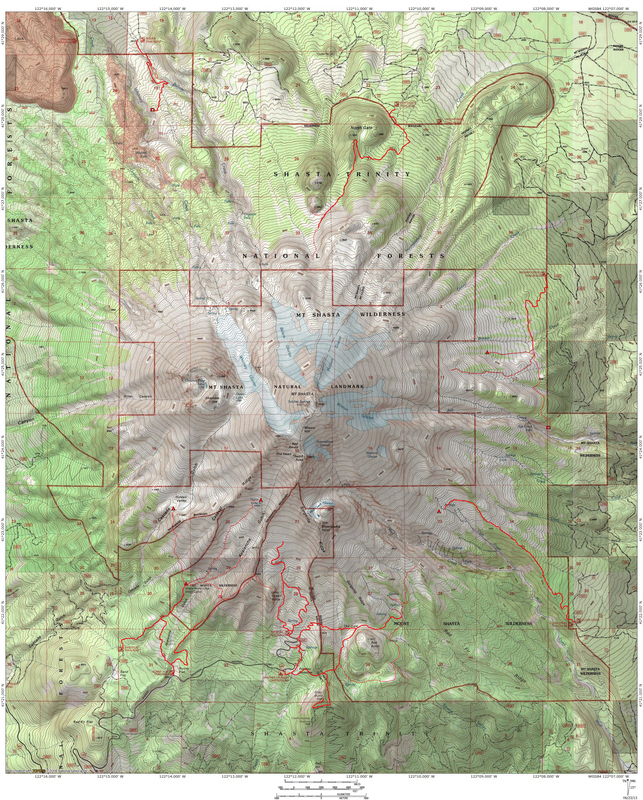 The Mount Shasta Landmark Locator can be helpful in learning the mountain’s geography. 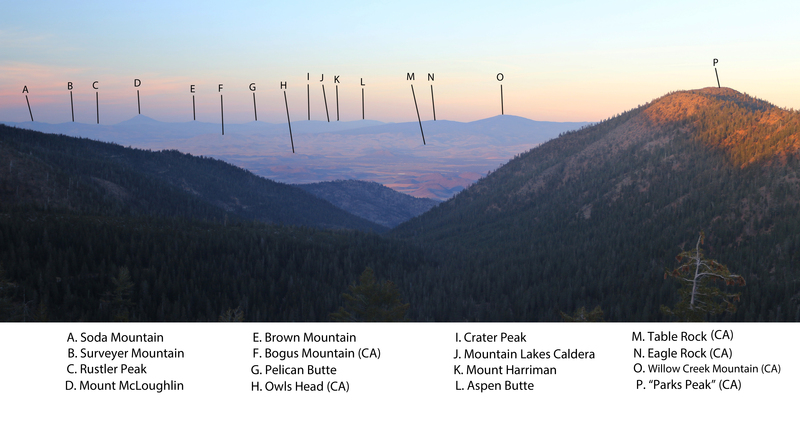 The Locator has detailed guides to the 4 cardinal orientations of the mountain. 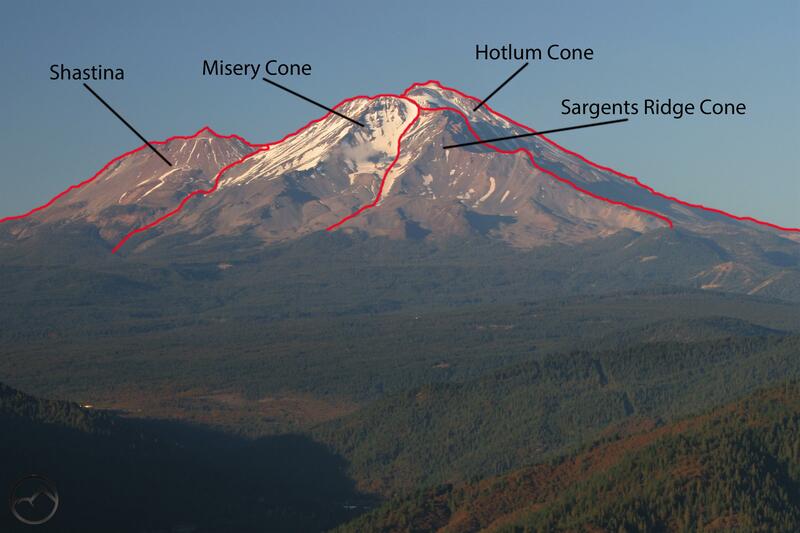 This is particularly helpful considering how distinctly different Mount Shasta appears from these perspectives. 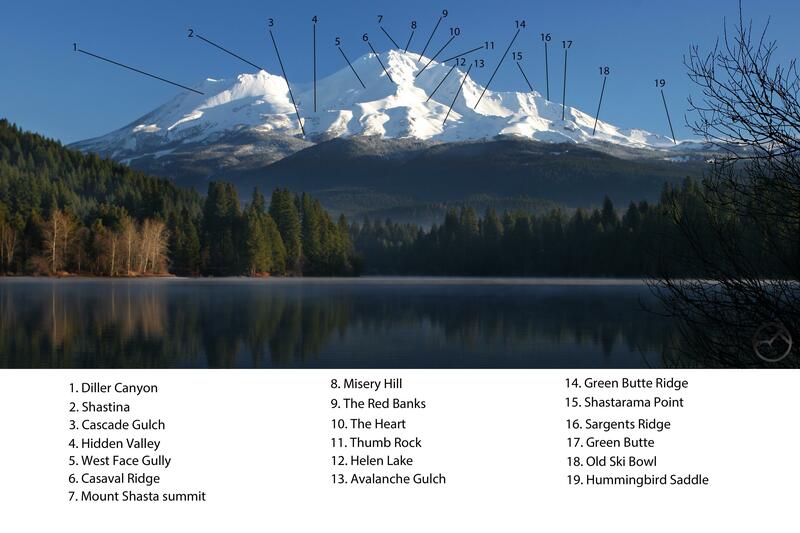 The impressive number of landmarks on Mount Shasta is indicative of the mountain’s complex geology. The fact is, Mount Shasta has experienced 4 distinct eruptive epochs, each adding a major quadrant to the volcano’s geography. This has heavily influenced Mount Shasta’s distinct appearance. Read more about these 4 eruption cones here. This article is an excellent companion to the Landmark Locator and helps explain many of the features identified there. 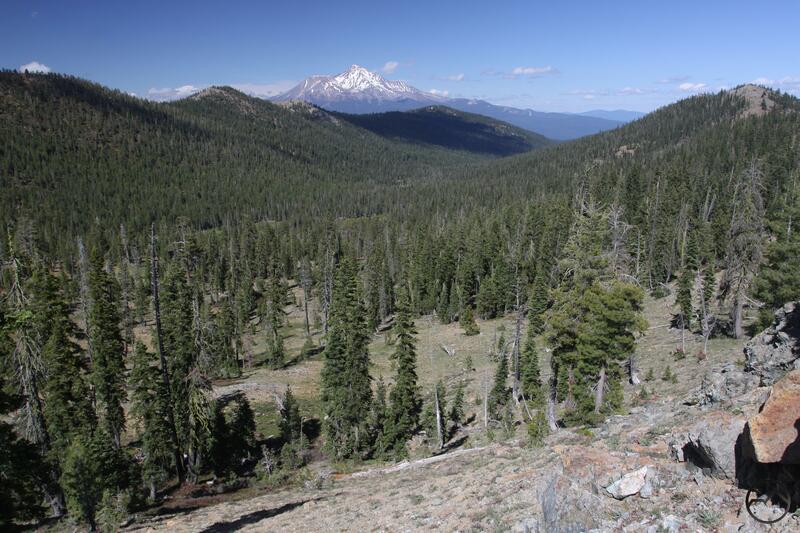 An article that puts Mount Shasta into the broader perspective of Cascade volcanoes does so by comparing the elevations of treeline on numerous mountains found in the range. This emphasizes Mount Shasta’s incredible size. 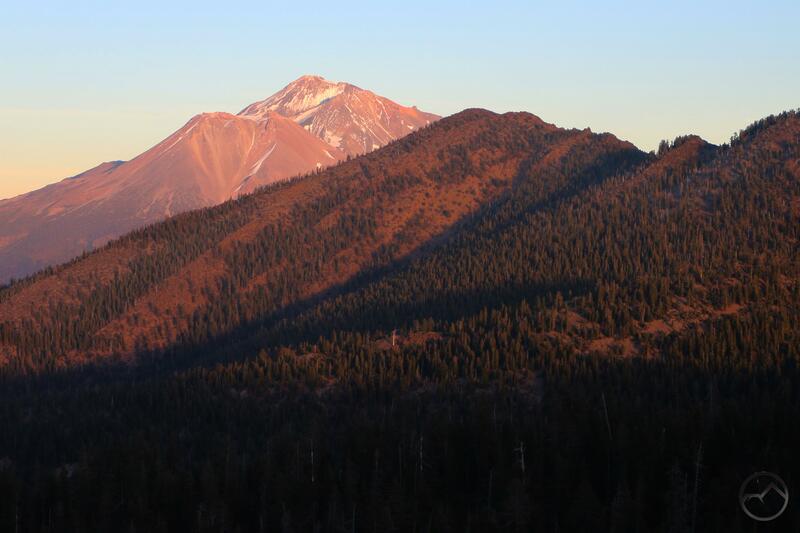 Another article examines the fossil remains of Mount Shasta’s medial moraine. The Hotlum Glacier once advanced several miles further than it does now, producing a medial moraine, the only one known to have existed in California. Mount Shasta may be the dominant peak in this corner of the country but there are other noteworthy summits that should not be overlooked. The two most obvious are Mount Eddy and Black Butte. 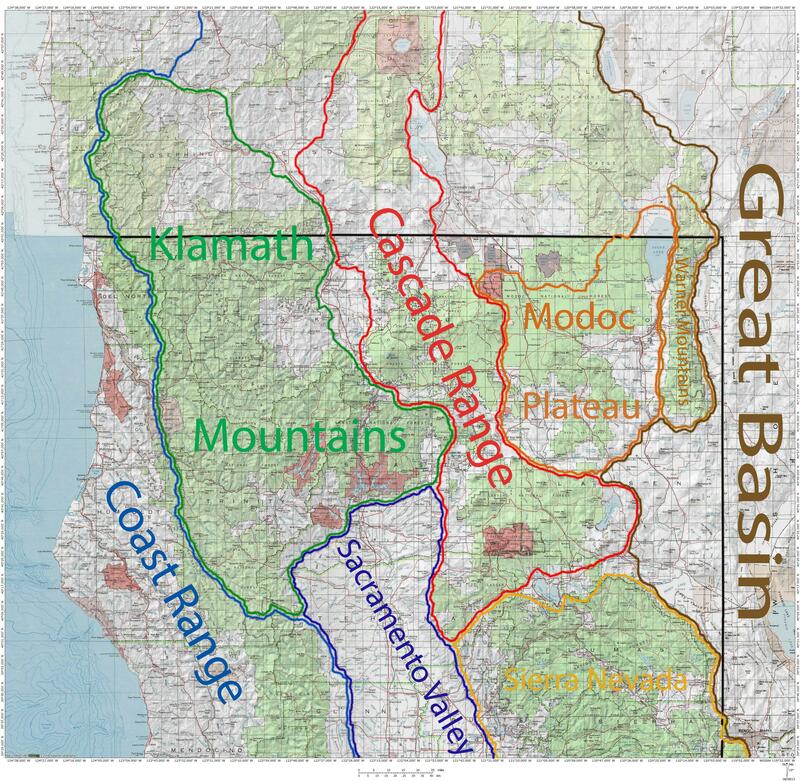 The former is the highest point in the Klamath Mountains and the entire coastal ranges of the coterminous states. Dotted with lake basins and boasting spectacular views, it is a premier destination in its own right. The latter of the two peaks is the westernmost summit of the California Cascades. 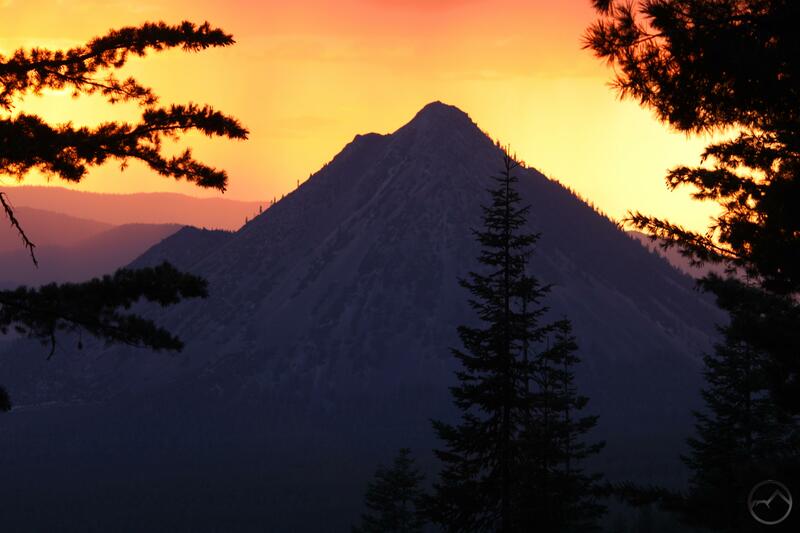 The distinct shape and prominent position make Black Butte an unmissable presence. 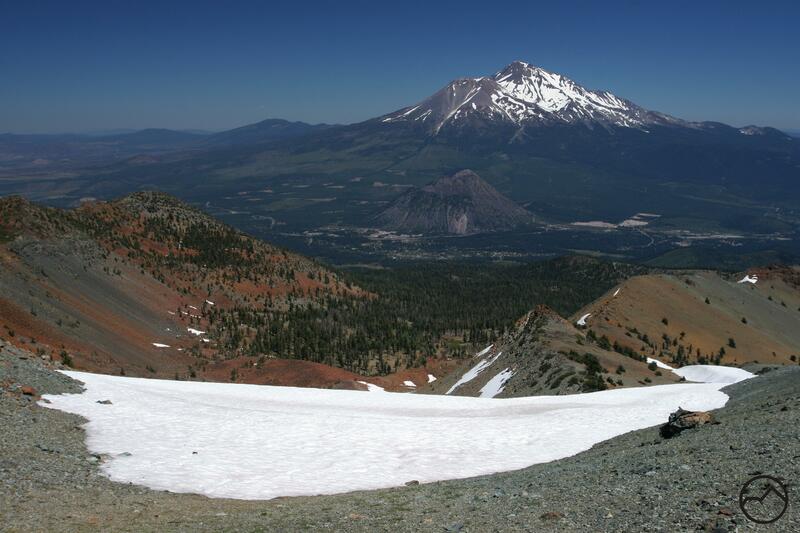 The trail to the summit is a Mount Shasta area classic. Three rivers flow around the base of Mount Shasta. The Sacramento River, California’s largest and longest river, begins nearby, while the McCloud and Shasta Rivers also begin in the area. Flowing through deep canyons, over large waterfalls and through broad valleys, these rivers are beautiful contrasts to the towering spire of Mount Shasta. 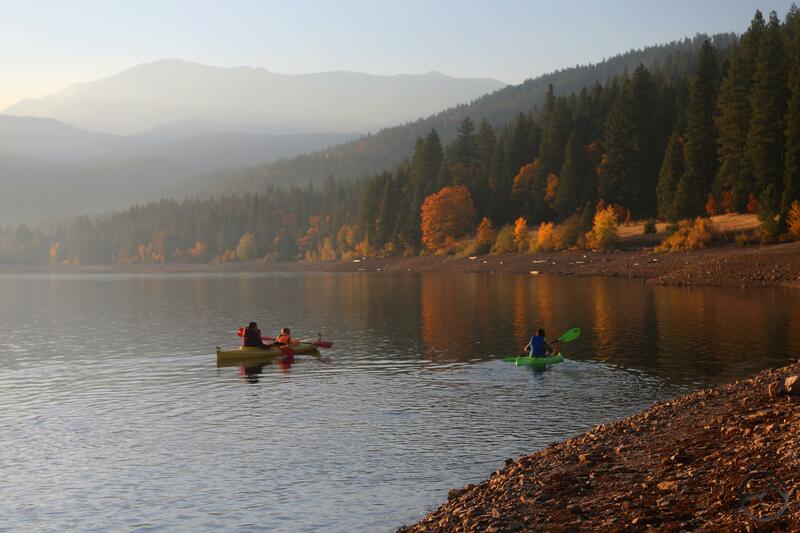 They also offer diverse recreational opportunities that include hiking, fishing and kayaking. In addition to the rivers, there are dozens of beautiful creeks flowing through the area. 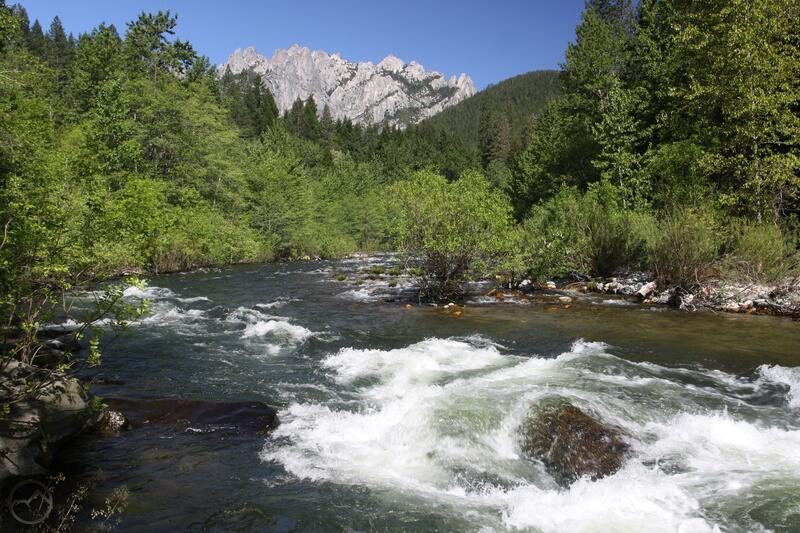 Wagon Creek and Castle Creek are probably the most notable but many others yield beautiful and refreshing destination. For those looking to explore, these are 5 of the best trails along rivers and creeks in the area. 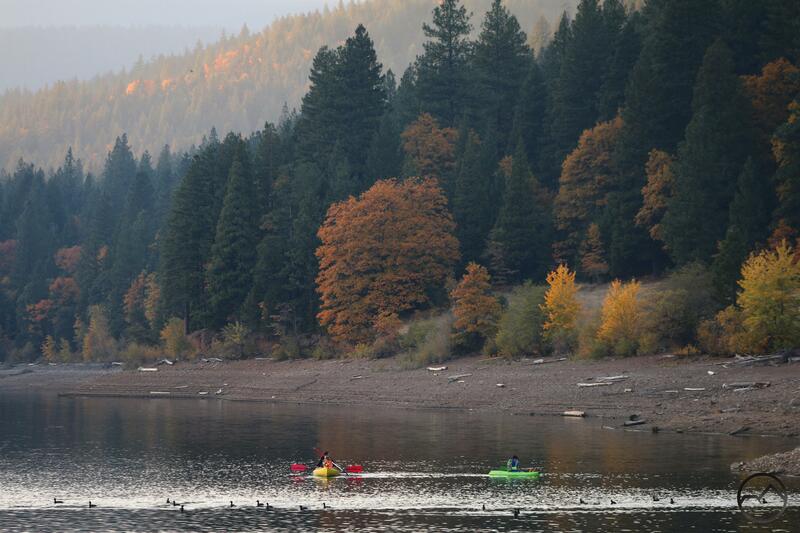 See the Mount Shasta Area Rivers Gallery. The Mount Shasta area has a number of fantastic waterfalls. This generally fit into two categories. The first are those that are found in the lowlands around Mount Shasta. Some of these are along the McCloud and Sacramento Rivers, a few others are in the mountains to the west of Mount Shasta. None are particularly high in elevation except Wagon Creek Falls. The river waterfalls flow all year so can be viewed whenever they are accessible. Those a little higher up are best in spring. The other category of waterfalls are those found on Mount Shasta. These are all harder to get to due to rugged access roads and terrain and, in some cases, lack of trails leading to them. Whitney Falls is the easiest to get to but its flow can be fickle. Ash Creek Falls may be the most beautiful of the bunch. See the gallery of Mount Shasta Area Waterfalls. There are a variety of places around Mount Shasta that don’t see many visitors but still offer spectacular scenery and fascinating geology. The tiny number of people heading to these places is in not indicative of how magnificent they are. This series of articles attempts to pique the reader’s interest and encourage hikers to get out and explore areas beyond the trail. 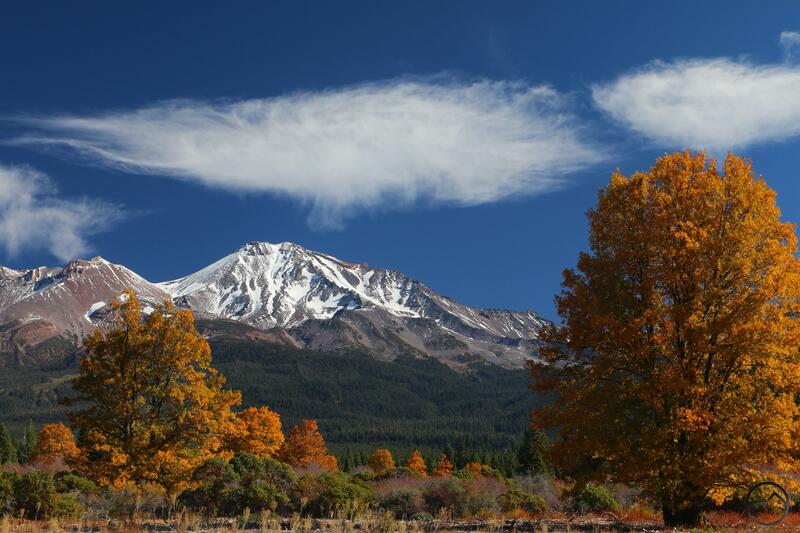 The Mount Shasta area is not well known for having great fall color. However the area does have some spots where the autumnal foliage can be pretty intense. This is due, in large measure to oak trees and the many trees that line riparian areas. Hiking along the Sacramento River, the McCloud River and Squaw Valley Creek are all places that are good bets to see some great collections of trees turning shades of red and gold. Aside from these areas, look for places with lots of oaks or willows to catch some of fall’s excellent spectacle. 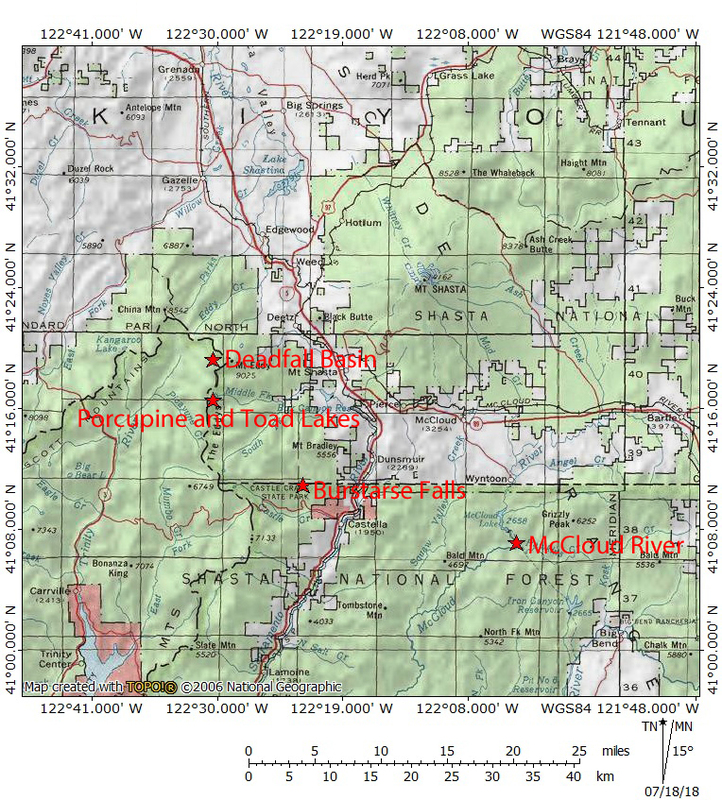 For those hungry for aspens, there are a few places to catch them, especially north of Mills Meadow and also a massive grove located near Tennant. Click here for a sample of some of the area’s fall color. Read more about John Muir’s thoughts about Mount Shasta here. This article collects several other discussions of vintage Mount Shasta subjects. I hope this is a helpful resource to all those looking to enjoy Mount Shasta. Thanks for investing your time in Hike Mt Shasta! Despite the clear skies, a finger of smoke from the Hirz fire drifts past Mt. Shasta. While yesterday proved to be a beautiful day, today proved to be even better. The skies were bright blue and the air crisp and comfortable. In truth, it really felt like fall, despite not even having made it to September yet. It was strange, in a way, to observe how the seasons had already started to change while we were living in a land with no shadows. The smoke that has enshrouded the region for a month blocked out almost any indication of summer passing away. It certainly blocked out the sight of all the snow melting off of Mount Shasta. Though the mighty glaciers still ensconce the mountain in ice, the western side has only vestigial patches of snow left. Despite its nakedness, we were all very glad to see Mount Shasta. The feeling of fall was especially true up at Castle Lake. My wife and I, drawn out by the clear air, moved most of the days schooling for our three kids up to the lake and spent several hours at the lake. The kids were in heaven, crawling around the lakeshore, wading in the water collecting specimens of all sorts of animal life. In general, it was an idyllic morning. The highlight occurred when my wife spotted a creature crawling out of the water and attaching itself to a rock. It turned out to be a dragonfly. The sight of the insect’s emergence from the old exoskeleton was absolutely remarkable. My wife got some really amazing video of the process. Talk about a day at school! 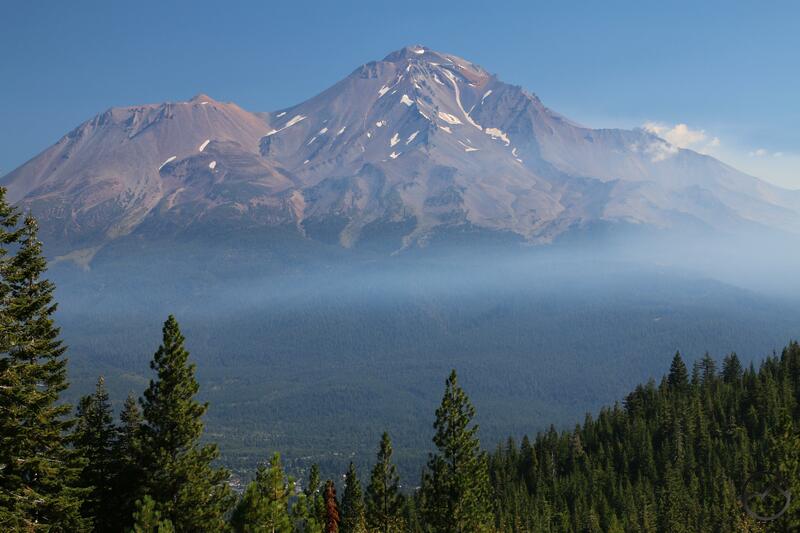 Smoke encroaches on the southern end of Mount Shasta. Smoke sweeps northeast, past the south side of Mt. Shasta. By the time we headed down from Castle Lake, the smoke had almost been blown out from around the mountain. Instead a line of clouds was starting to take shape around the upper reaches of Mount Shasta. These clouds continued to gather strength until later in the day it covered the summit. While I missed seeing the entirety of the mountain, it was great just being able to observe the beauty of the light, fluffy clouds. It is amazing the gratitude one can feel for things as basic as clouds and blue sky after living within the forest’s funeral shroud for a month. School may be here but the summer is not over yet! There is still a lot of time to get outside. At the very least, we’re only halfway through the season when the Old Ski Bowl is open! If anything marred the day, it was the return of the smoke in the evening. It wasn’t too think but I could smell it and the view definitely turned hazy. 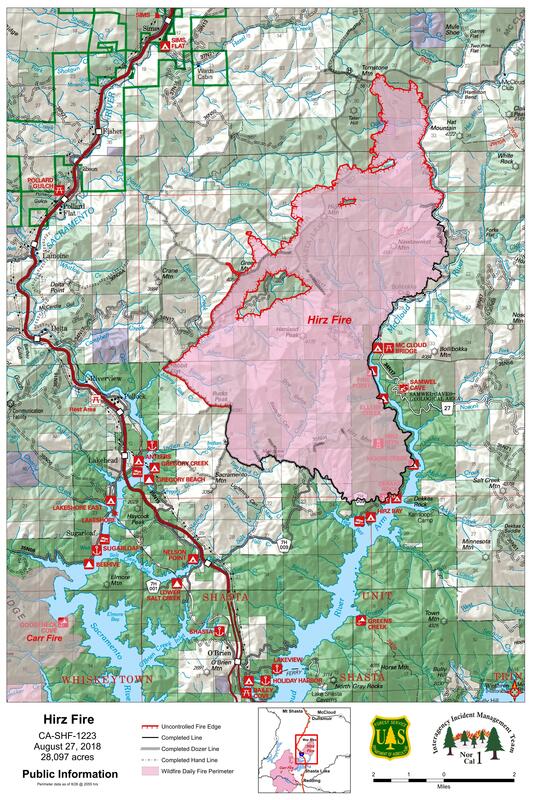 Just like with the Carr Fire, the plan is for the lines to get cut in and then let the fire burn itself out. I certainly hope that this will soon be the case. One thing that made todays conditions so interesting was that it was close to what I would have imagined the conditions would have been like if all the other particulate had not been put in the air by all the other fires. I am not sure where all the smoke that has been plaguing us got blown off to but the smoke stew seems to have been flushed out pretty effectively. I sure hope that is a continuing trend. An unnamed lake below Mount Eddy in Deadfall Basin. 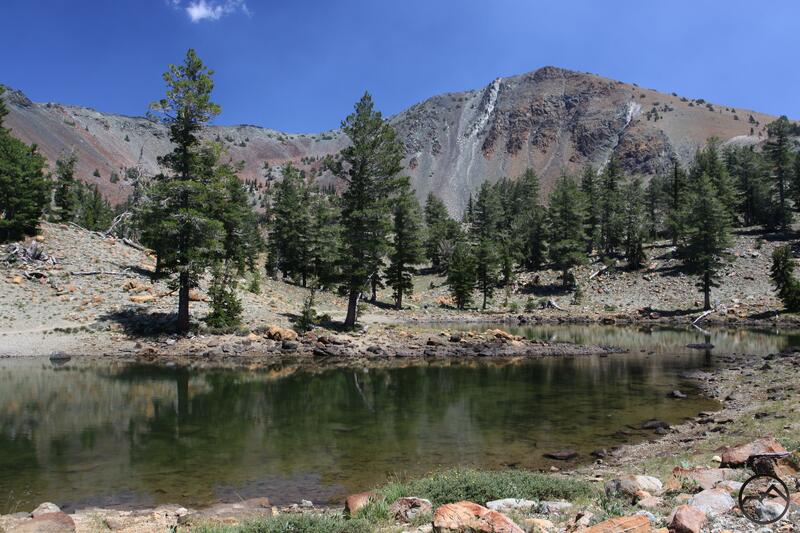 For the fourth installment of the PCT Spotlight, it is imperative to feature the hike to Deadfall Basin. This section of trail ranks in the upper echelon of Mount Shasta Trails, alongside other area classics like Heart Lake, Black Butte, and South Gate Meadow. The reasons for its renown are many and include excellent views, lush meadows, gorgeous mountain lakes and the chance to ascend Mount Eddy, where astounding summit vistas await. The Scott Mountains from the PCT. The hike on the PCT to Deadfall Basin is an easy journey. The trail maintains a very gentle, steady grade for a few miles before arriving at the edge of the basin. However, despite the ease in getting there, it is one of the prettiest trails around. This part of the PCT is graced with numerous springs, which result in some extremely lush patches of meadow. Wildflowers are accordingly abundant. The trail also boasts many excellent views, most notably of the Scott Mountains, which lie to the west on the far side of the Trinity River. Once in Deadfall Basin, cliffs rise dramatically overhead and numerous lakes dot the landscape. 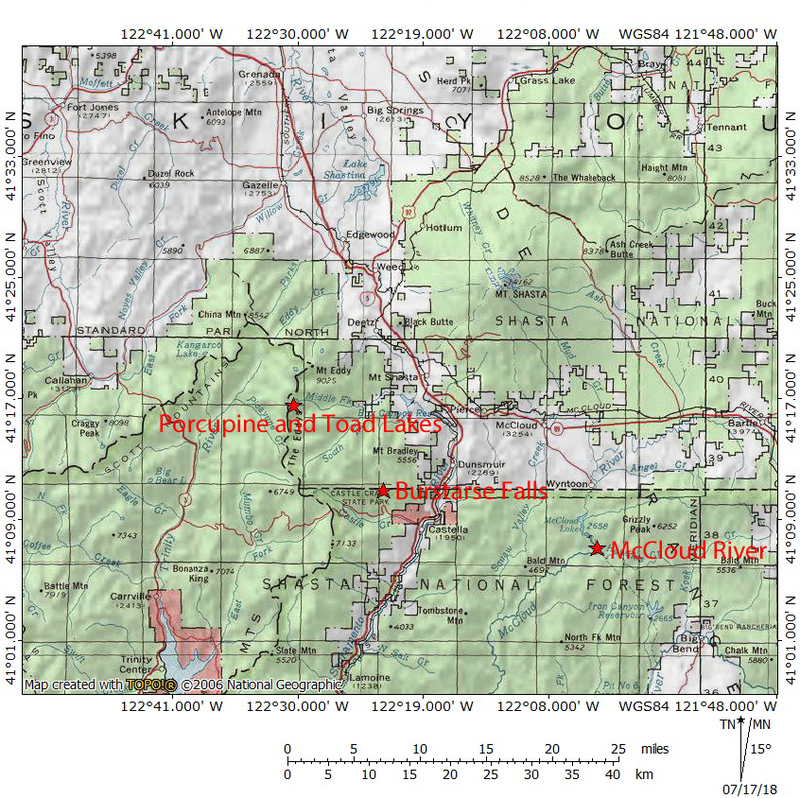 Most notable are Lower, Middle and Upper Deadfall Lakes. From the upper lake, a trail continues on to the summit of Mount Eddy, which looms prominently over the basin. This is a great section of the PCT. For hikers making the entire journey, this is the final portion of a roadless section that stretches north from Gumboot Saddle to Parks Creek Pass (the trailhead for the hike to Deadfall Basin). Most hikers, however, will hike south from Parks Creek and enter the basin from the north. Whether coming from the north or south, Mount Eddy has featured prominently from the trail for quite some time. Despite this, it is also when in Deadfall Basin that Mount Eddy presents its most inspiring visage. Here the mountain, the tallest in the entire Klamath Mountains, rises dramatically to a single point, showing off its multi-colored geology in spectacular fashion. Mount Shasta and the Cascades seen from Mount Eddy. Though not a part of the PCT itself, the hike to the top of Mount Eddy deserves special mention here. After hiking through Deadfall Basin, a trail climbs up to the mountain’s summit. The view from this point is probably the most spectacular in the North State. The area it encompasses is immense, stretching from Lassen Peak in the south to deep into Oregon in the north. 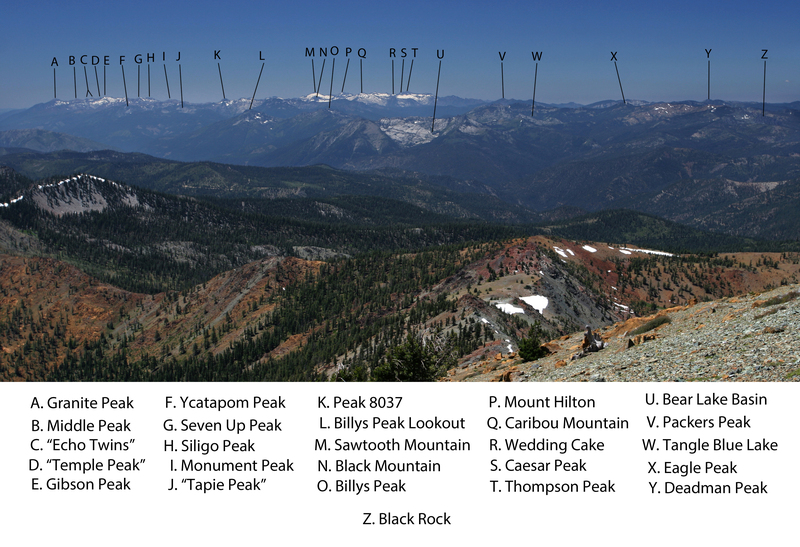 All around the peak are the numerous ranges of the Klamath Mountains, all of which are visible from the summit. Most prominent, though is the magnificent bulk of Mount Shasta, which lies only a few miles to the east, dominating everything. Looking down on Deadfall Meadow. A small waterfall below the PCT. A gorgeous spring alongside the PCT. The trail crosses a lively stream. Deadfall Basin along the PCT. Foxtail pines on Mount Eddy. Mount Shasta and the Cascades seen from Mount Eddy in the Klamaths. It seemed natural for the third installment of the PCT Spotlight to feature a trail that began at the Gumboot Trailhead. There are two great options here. 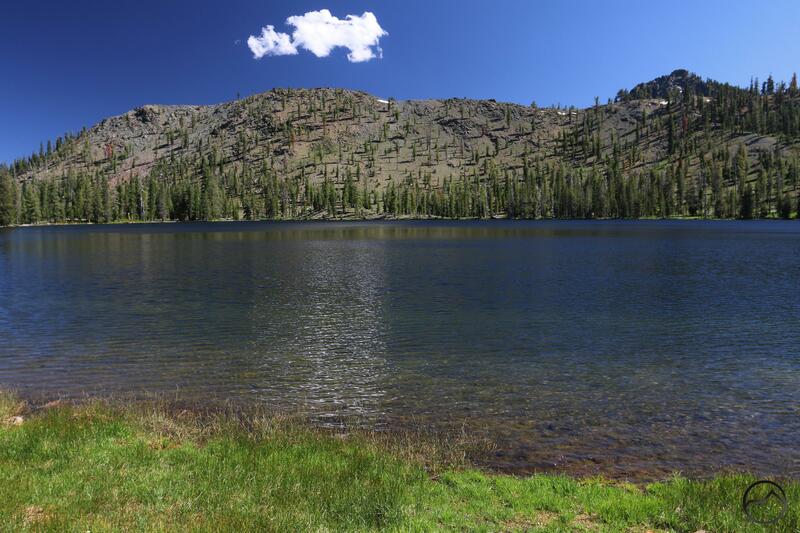 First is the trip south to the Seven Lakes Basin. The other is the hike north, to Porcupine and Toad Lakes. I ended up choosing the latter, for a couple of reasons. One reason is that the trails sees a little less use. The main destinations are further away than the hike to the Seven Lakes Basin, so more people tend to head to the south. The second reason is that this section of the PCT features more views of Mount Shasta than just about any other part of the long trail. That is tough to argue with! 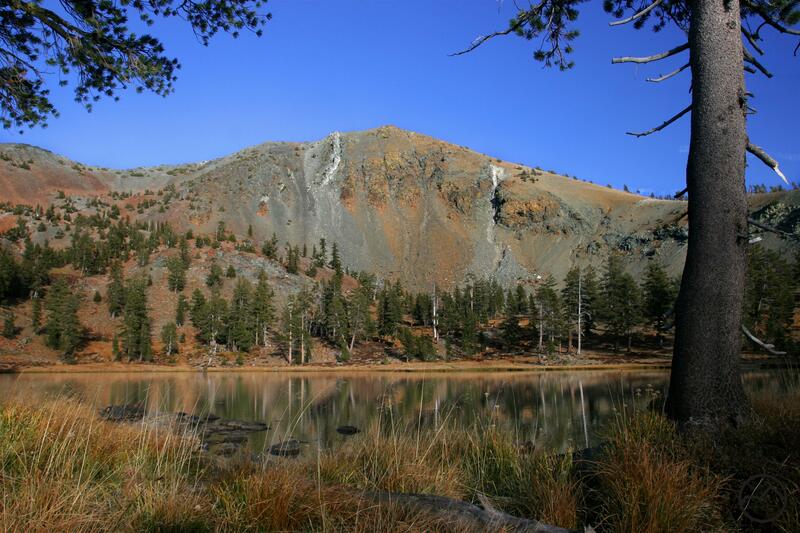 The hike to Porcupine and Toad Lakes is the longest hike to be featured on the HikeMtShasta PCT Spotlight. It is 11.5 miles to Porcupine Lake and 13 miles to Toad Lake. Of course, if one braves the road up the Middle Fork of the Sacramento River, it is possible to shorten the hike considerably by starting at Toad Lake. In spite of the length, the hike is well worth the effort. It is one of the prettiest trails in the region, with views of Mount Shasta, and the Trinity Dividen as well as vistas of the Trinity Alps to the west. The hike’s destinations are are the two lakes, which are quite different in character. Porcupine Lake occupies a rocky basin right at the base of beautiful Porcupine Lake. Toad Lake lies in a bowl cut into a vein of peridotite rock, which results in sparse vegitation on some parts of the ridge above the water. Both are quite beautiful. This is a great section of the PCT. After some gradual climbing over the first couple of miles, the trail reaches the crest of the Trinity Divide and levels off. It then begins a very easy traverse along the top of the Divide, weaving back and forth between the east and west sides of the divide. The trail also passes through some very remote sections of the Trinity Divide. Fawn Creek Canyon, part of the South Fork of the Sacramento River is visible from the trail, as is the large basin that forms the headwaters of the Middle Fork. Geologically, the trail passes through some varied terrain, with large outcroppings of gabbro and peridotite, both of which are typical of the Trinity Divide. There are a few springs and lush meadows along this great section of trail as well. More fascinating geology and great views lie beyond Toad Lake too, for those willing to push further. Gumboot Lake and the Cliff Lake Basin. Porcupine Peak and Mount Eddy. Toad Lake from the PCT junction. The trail wraps around Toad Lake. 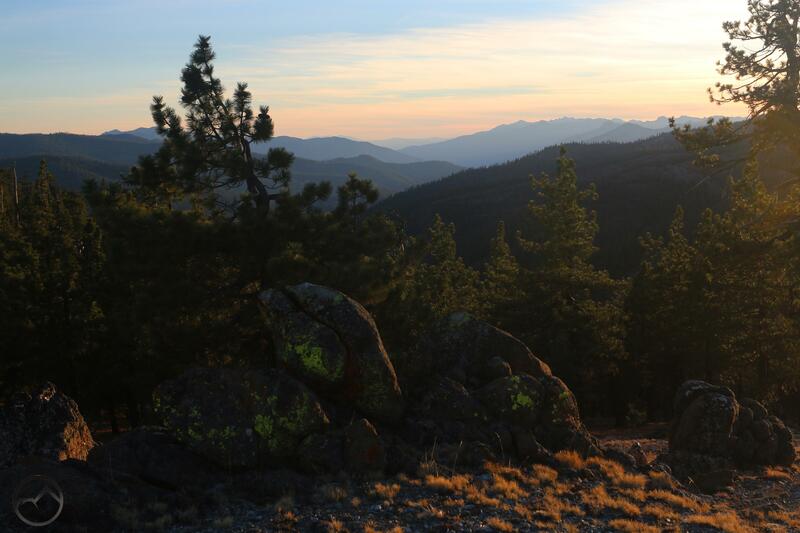 Sunset in a hypothetical Mount Eddy Wilderness.